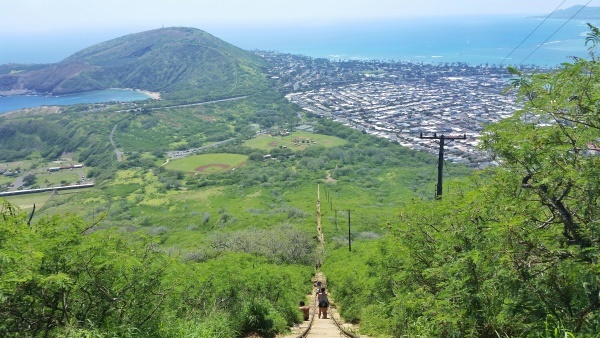 The Koko Crater Railway Trail, commonly called the Koko Head Hike, is known for being able to get you breathing hard, and for that reason it’s also called nature’s stairmaster! And it’s called a stairmaster, because you are basically taking stairs all the way up to the summit. This also gives it the name Koko Head Stairs. 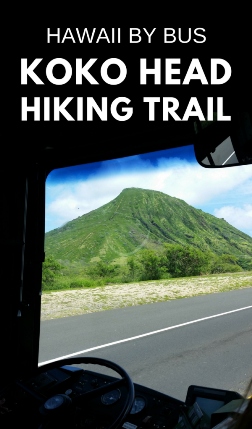 Learn more about the Koko Head Hike here. The Koko Crater is easy to reach by bus from Waikiki. For the quick directions, here they are! Be sure to change the departure time and starting point for more accuracy. It’s the bus stop right before turning onto Hanauma Bay Road if you’re looking at the Google Maps app when you’re sitting on the bus. You’ll be able to take a single bus to get to Koko Head without getting any bus transfers. The bus from Waikiki to Koko Head takes about 45 minutes, depending on where in Waikiki your departure point is. To get to Koko Head, you’ll want to get off at the bus stop in front of the Hanauma Bay sign. There are 2 bus stops that say “Hanauma Bay,” and you’ll want to get off at the first one. If you miss the first bus stop, no problem! Just get off at the next Hanauma Bay bus stop, and you’ll just have to walk an extra 10 minutes or so to get you back to that bus stop you missed. Once you get off the bus in front of the Hanauma Bay sign, you’ll look across the street, and there begins your hike! This is not the official start of the trail, but it’ll lead you there. 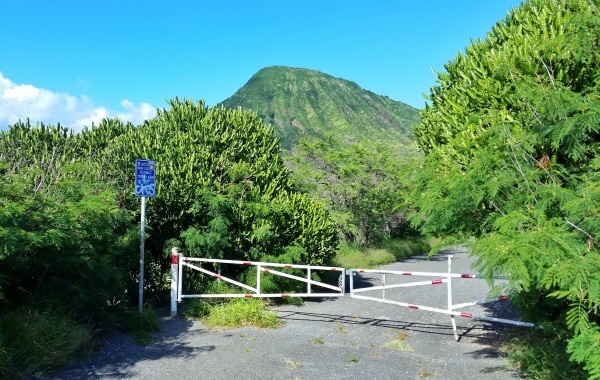 The road may be blocked to be off limits to cars, but if you’re walking, you can take the road to get you to Koko Head Trail. Since Hanauma Bay is a popular tourist attraction, the bus ride to Hanauma Bay, and thus to Koko Head, can become crowded. That means that you may be standing until it’s time for you to get off the bus if you go at a busy time. So if you have a choice between 2 bus stops in Waikiki, go for the earlier one! Use Google Maps public transit directions to help plan your trip to Koko Head by bus! If you look at Google Maps and it’s saying you need to transfer buses from Waikiki, it could be the time of day you’re looking at it. In this case, change the “leave now” option to “depart at” some time in the morning or early afternoon. Bring your own food and water to Koko Head! 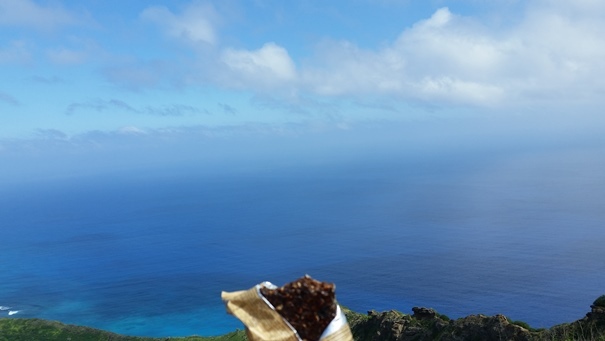 And the only emergency food you can turn to if you start to feel faint on the trail from the strenuous workout Koko Head gives you is what you have packed in your backpack! If you’re not carrying a backpack, at the very least, carry an energy bar or two in your pocket. 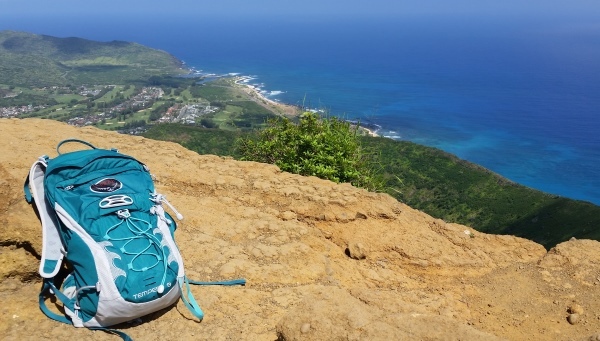 This hiking backpack, pictured below at the Koko Head trail summit, is perfect! If you’re looking for a post-workout meal for after that Koko Head workout, there is a snack stand at Hanauma Bay across the street. There’s one before the entry point to the bay, and there are a number of picnic tables around. Down the road in the direction that you came from towards Waikiki, there’s the Koko Marina Shopping Center. That’s a 20 minute walk, or you can wait for the bus to take you a mile down the road. (But the walk can be a good cool down after the hike. ;)) In the shopping center is Paina Cafe where you can have a taste of the traditional Hawaiian dish known as the poke bowl! PERFECT post-meal workout at a Hawaiian style restaurant! They have plate lunches, sandwiches, and salads too, if you don’t want to go for the poke bowl.